Grappig…, ik voel met ze mee! Alhoewel ik de laatste jaren vaker de auto pak als het zo hard waait. Beautiful photo, I like the simplicity of this shot. I love the composition with the intense green playing against the grey/white of the water and sky and then the small figures of the cyclists so contrasted against the background. I\'m guessing you do a lot of photoshop work on your shots to get to coloration where you want it (lots of saturation + contrast?). Great stuff. When peace is a priority, a country will find ways to access it\'s resources – peacefully!! As usual, the composition of this image is so telling of the place it is capturing.. 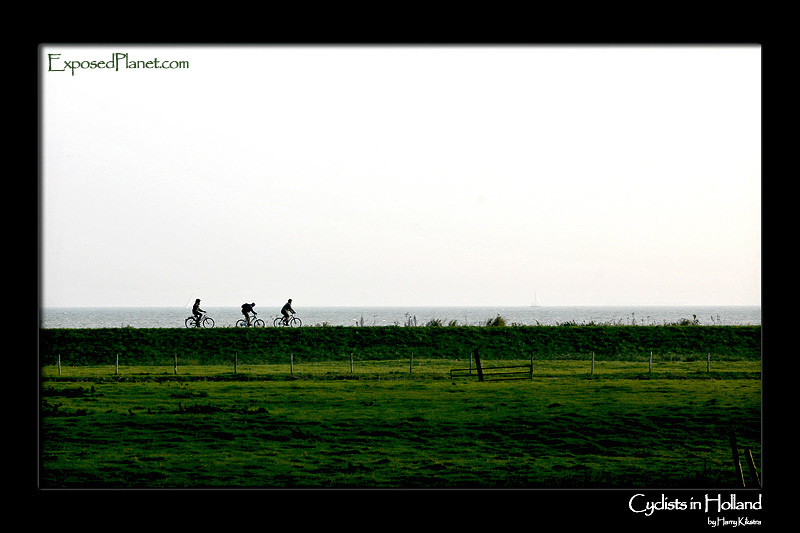 The story behind "Dutch Cyclists fighting the wind on a dike"
A very large part of The Netherlands used to be sea. Using dikes to isolate the water into lakes and then windmills to take the water out, more and more land was reclaimed, which was a much more friendly and economical way than starting wars over it with other countries. This shot was taken on the island of Marken, actually one of the fewer places that was already sticking out of the Dutch South Sea. As the sea was dammed, the water in the back of this dike is now actually a lake. Marken is a very well known tourist spot as the island is now connected with the mainland through a dam as well.